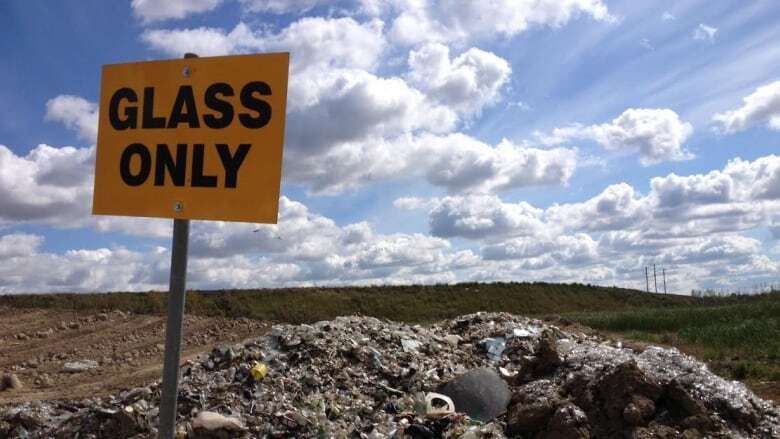 City-paid recyclers in Saskatoon and Regina reveal to CBC that they bury most household glass at landfills instead of recycling. A CBC investigation into what happens to recyclable household glass in Saskatoon and Regina has revealed the true fate of the containers. Most of the glass that homeowners conscientiously wash and rinse before placing in the blue bins is not recycled. The reality is that most of the glass breaks in transit to the recycling depots, or shatters when it's dumped onto the concrete floors for sorting. And those shards end up buried in a landfill. The jars that don't break still go to the landfill, where they're stored in makeshift piles for down-the-road recycling. City officials in both Saskatoon and Regina were caught off guard by the CBC findings. The main conveyor belt at the Loraas plant. (CBC)In Saskatoon, the city chose to respond to CBC questions by email. The city believed that Loraas, which has the blue bin contract, is recycling the glass. "The City understands Loraas has been re-using a significant amount of glass collected from the program in road-base construction," officials wrote. But according to Dwight Grayston with Loraas, that's simply not the case. Better than half of the glass that comes into the company's Saskatoon facility ends up shattered and buried in its landfill north of the city. The balance of the unbroken glass is stored in a makeshift pile at the same landfill for future recycling. This came as a surprise to city councillor Mairin Loewen, who also sits on the Environmental Advisory Committee. "I don't think I was totally shocked that there is difficulty in finding other uses for this material, but certainly I'm hopeful that we can find some other alternatives other than landfilling the material," she said. "It's not surprising to me in some ways that we're having difficulty with this, but I also had been hoping and assuming that we were finding a more useful home for that glass that's being produced by this program." In Regina, the city deferred questions about glass recycling to its private contractor, Emterra. When asked what city's plan was to recycle pickle and jam jars, Lisa Legault, the city's director of solid waste, said " that is a question that you have to ask Emterra." Over the past year. Emterra has taken in 650 tonnes of glass from Regina homes. As with Saskatoon, though, the majority of that glass breaks in transit or through sorting and ends up at the landfill. The intact jars are stored for future recycling. Loraas also receives revenue from the sale of processed/sorted material. But it also pays for the cost of landfilling the un-recyclable material.